The old Protestant Georgetown cemetery in Penang is a fascinating place to wander around and if you like old colonial graveyards as I do, then you will really like this one! This was the first cemetery in Penang Island, which was then named the Prince of Wales Island by the British and contains the final resting place for many of the founders of the first major settlement on the island. The first known burial took place here in 1789. Most of the graves are of the leading British families of the early settlement of Penang, with a few other nationalities of European descent. 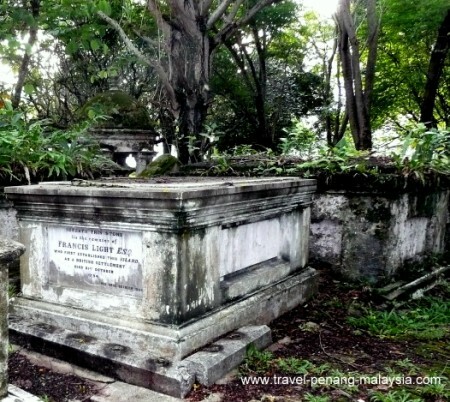 Captain Francis Light, the founder of colonial Penang was buried here in 1794 along with several other Governors of the early British trading port. The cemetery was closed for further burials at the end of the 19th century (in 1892). 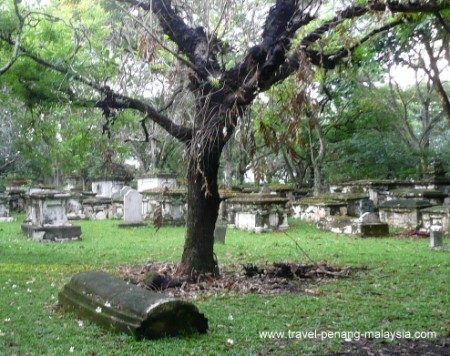 The Penang Heritage Trust took on the job of trying to restore the gravestones and tombs in 1994 after many years of neglect. There are also 12 Chinese graves. These were Chinese Christians that had fled from the Boxer Rebellion in China and the persecution of Christians. Also buried here is Thomas Leonowens, husband of Anna Leonowens. She is famous for being the governess to the many children of King Rama IV of Thailand. Her experience there was later turned into the classic film, The King and I. There are two parts to the graveyard separated by a wall (with a small doorway). The Protestant cemetery and the smaller Catholic cemetery behind the wall. The old Cemetery in George Town is located on the left-hand side of Jalan Sultan Ahmad Shah, a few hundred metres past the junction with Jalan Penang (Penang Road). It is easy to find, just walk along the road from the junction and the cemetery wall is on your left. The entrance is right at the end of the wall. The mosquitoes seem to love this dark and damp place and like to bite any time of day, so put some mosquito repellent on if you don't want to get bitten! The Founder of the first British settlement in Penang. 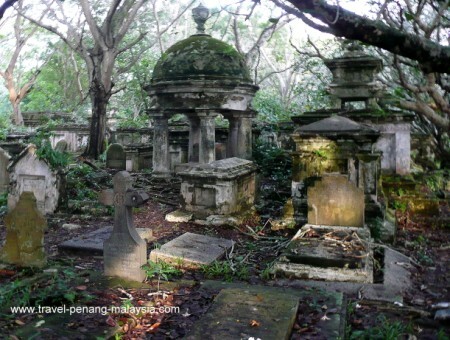 Tombs & gravestones covered in moss and shaded by Frangipani trees. 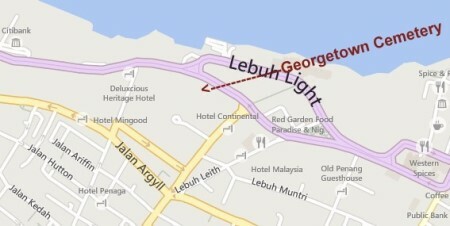 For more places to visit in the old part of George Town, click on a picture below of any place that interests you.